OK, all, here it is as best we know right now. Some things may change a bit here and there, but not the major stuff. First off, we're going to say this is ATV, snowmobile and foot traffic only. There may be enough safe ice to drive vehicles on by Bashtime, but it's a chancy thing. And if you DO drive out on the ice, do not park ANYWHERE near other people or vehicles. The ice may hold you up, but it probably won't hold six of you parked in a row up. That being said . . . HQ will be out on the ice in front of the Van Vac landing, just like last year. It's an easy walk for those with no on-ice transportation, and there's good fising water all along that shore in 40 to 60 FOW. But we're hoping a few people with transport will help other out and ferry some people here and there. Quite a few of us are fishing Friday, so when we all meet at 8 a.m. at HQ to get things started, we should have some up-to-date reports. We'll be handing out Burntside maps courtesy of Sportsman's Connection made just for this event. Fishing contest? Nope. Just a fun get-together. Prizes? Not many, just a few. We've got a few cards of lures to give away and FC is going to provide some St. Louis County books of maps to give away. I'll try to finagle a few more prizes from a couple of the local bait dealers too, but there won't be any major drawings or anything. After everybody hits the ice and starts fishing, there may be no one at HQ for several hours, because it's a loose event and Frank and I want to fish, too. Depending on ice conditions, end of the line's permanent sleeper shack may be the HQ if we can haul it out on the ice, but again, please do not park vehicles near it, if you must drive out in trucks. We don't want a tragic day, but a fun one. Anyone who wants to fish til dark certainly should feel free to do so. But anyone who wants to meet about 3 p.m. back at HQ for grillin' chillin' and fillin' should plan on that. Whatever prizes we have we'll give away when we've got the brats eaten. Two excellent bait stores are Great Outdoors and Babe's Bait and Tackle. G.O. is stategically located across the parking lot from Mike's Liquors about half way through town on the north side of Sheridan Street. When you pass Zup's food store heading east, it's about a block and a half up on your left. Babe's is strategically located on the very west edge of town. It's the first building you see when you hit Ely, and the last you pass on your way west out of town to Burntside. Both have bait that's lively, talk that's lively too, knowledge of the subject, and will be open early on Bash day. Babe's is opening at 6:30, G.O. at 6. To get to the Van Vac public access: About four miles west of Ely, turn north off of Hwy. 169 onto Grant MacMahan Blvd (County Hwy 88). I don't know the exact mileage, but you'll cross a bog, then the Burntside River, and will turn left on Van Vac Road (County Rd 404). You'll go a mile or so and the public landing will be marked with the standard big brown sign on your right. It's a pretty steep hill. It's a two-tiered parking area, with parking slots and turnaround down at lakeside for dropping off and picking up gear and a larger lot higher up. Considering just how many people may show up, it's likely there won't be enough room for all vehicles in the two lots, but I've never heard anyone running into trouble by pulling far over and parking on one side of the approach road, and I think it's OK to park on 404 if you pull far enough off. More details, things I've forgotten? Well, I'm sure you'll remind me. Let the final Bash planning begin! Thanks Steve for the info, you guys do a hellofa nice job putting this thing together every year. It sounds like we will have a banner or two to mark the headquarters for the Bash. If the ice is thick enough we'll try to set my shack up fairly close to the access so we can use it for a meeting place, if not it will most certainly be on shore at the access. As Stfcatfish said, if its on the ice try not to drive a lot of vehicles to close up to it. The house has 110V and 12V if anyone needs to use/charge something. I'm bringing the generator. I will be staying in it at night so if you need something hopefully I can help. Thanks and see you all there! Would it be fair to assume one should bring 2way radios?? Bring the radios channel 7 with no sub channel. EOTL, The wheel house will make for a good wind break, any chance you bring a grill along? One other thing, whats the floor and axle rating. As a note, the access road which is a pretty steep 's' to the landing was pretty much glaze packed snow/ice. I wanted to park the 6.5x12 in the parking lot last week and envisioned taking the off road route to the lower parking lot. I did see some trucks with snomobile trailers on the bottom parked on the ice but I also saw a set of tracks that missed on the corner going down. I have a smaller grill I can dig out of my camper for the bash. My other grill is a Stainless Steel monster. There is an oven and 3 burner stove inside as well. I am headed up Firday morning and I am bringing my weber grill. I don't have a wheeler or sled so if I can't drive my 1/2 ton out I could use a little help. I plan on bringing up some pork loin to share so my grill will be occupied for about 2 hours. If we plan on meeting back at head quarters at 3:00 I could start the loin early and we could eat that first. As far as fishing Friday goes is there any kind of game plan? I'll be doing my part to take care of your Pickled Northern needs. I just put 3 quarts in the fridge today that are just for the bash. I also plan on bringing up some cheese and crackers to go around. I will be leaving Duluth in the early afternoon on Friday with my daughter Stacey and we should be up there before dark. If there is enough light left in the day we may stop by the lake and say hello. If not we will see most of you at the motel Friday night. I'll try and have my radio on if I'm at the lake or the motel so give a yell if you feel like it. It cannot come soon enough. Frank and Steve, if there is anything I can do please give me a shout. I will have my wife bake up some brownies for the lunch. I will also bring some venison sausage for some snacks. I will have one of the small weber grills to share. Also, I can shuttle some people if need be. I will be on the green Can-Am and my buddy will be on a yellow Honda Foreman. Flag me down and I'd be glad to help. Tried to email ya a couple days ago, but it got returned. I'll give youe a call at home tonight so we can put the final details in place. With the forecast looking good I am planning on bringing X Junior if its still OK with you. My Otter and your wheeler too?? I am gonna do whatever I have to do to get out of work shortly after 1 on friday so that we can drive up together, what time can you take off? Got everything unfrozen and fixed from last weekends trout adventure (had the dogs in the rewind literally explode in the cold). I can bring some venison steak and salamini's for the grill too. I can leave whenever your ready. I'll be packed and ready by Thurs night. Yeah, my wheeler & your portable should be fine as well as little D. Not sure if Carver is coming with yet, I'd like to but we'll see when it gets closer. Also you've got radios right? Looks like I am coming up Sat morning with my dad and both our wheelers. I can bring my little 12x20 grill. Hoping to borrow a flip over from Loonasea. Catfish, I called Jim Jaekel and asked him to come up with my Dad but he said he was too busy but thanked me for the invite and thinking of him. He sends his regards. Myself and Mnwildman (AKA) junior will be heading up from the cities Friday morning. We will be staying in Tower. 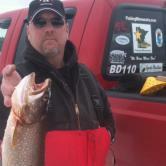 Was maybe planning on fishing Vermilion Friday for some walleyes. I have never fished the lake before, anybody have any information to share ? Viking try mckinnly bay they have roads ploe out. Straight out to birch island right next to ely island. 30 fow. early and late. seeyou sat. Viking...which Lax HS? What year? I graduated from DeSoto HS in 82. I'll look for you. I'll be tooling around on my green articcat 4 wheeler with my dad who has a red polaris wheeler. looking forward to the b-bash this year. had a great time last year and hope to see some 'old' faces and some new ones. If there is anything I can do to help let me know. My bad, i saw Jaekel and thought of Mike, and you were talking about Jim. I'm an '80 Aquinas grad, tho i did have a couple guys from DeSoto that i met playing football and at a hoops camp, and hung out with a little. I know one was a Curt Mikkelson, went on scholarship to Iowa and I saw him his first year when they played the Badgers. The other was the quarterback, I think it was a Nicolletti (sp)? Good guys and had a few laughs with them many moons ago. See ya at the bash! Thanks for the info Ripstick, we are going to give it a shot. See you on Burntside Saturday. I drove out from Van Vac to Brownell and Lost Girl Islands today. There was a plowed road and 18" of ice where I fished. You must have hit a rare, exceptionally thick area of ice, but do not believe it is the norm on Burntside. Every report I'm getting is about 12 inches, with as little as 8 on one part of the North Arm. The cold snap didn't seem to add any ice whatsoever, which is very strange. Be carefull where you go with a vehicle, and don't pull along side of another one to talk. I personally, would not drive a full size truck on it with the ice as it is, and I have lived on the lake for 33 years. Ask Gary what he had on the North Arm this weekend He drove out there yesterday.